12,300 businesses, 700 towaiting rooms etc. do you like helping people? enjoy working in a team? want to learn new skills? have about 6 daytime hours free each week? AID WORKER MELANIE RISKS KIDNAP IN WAR ZONE Helensburgh-born aid worker Melanie Ward is helping Nigerian schoolgirls get an education despite the continuing threat of armed group Boko Haram. Working on the dangerous front line in the north east of the country she and her team are in constant danger from armed attack and kidnap. a difference by helping 62,000 traumatised children affected by the fighting in the north-east recover and then get back to school. Around 100 of the 276 female students kidnapped from the village of Chibok in 2014 are still held captive. “With DFID’s help, we also provide specialist support to the most vulnerable people hit by the conflict including women, children and disabled people. Melanie – based in Abuja, but travelling frequently to the north east – is currently overseeing IRC’s UK Aid-funded projects on education and protection to help tackle the humanitarian crisis. Government soldiers and Boko Haram extremists. known to kidnap aid workers, and they killed two female Red Cross aid workers in September and October last year. It was an awful tragedy – they were midwives. using smart technology, to see how much gas and electricity they are using so they can spot ways to use energy more efficiently and save money. Eamon King, Senior Project Officer of Change Works in Argyll, said, “We’re looking forward to working together with the community to support householders and businesses to make energy efficiency improvements, cut carbon emissions and reduce heating bills.” Eamon will be holding a weekly drop-in advice hub every Wednesday afternoon from 12.304.30pm at the Three Villages Hall in Arrochar. Keep up to date with events and activities by following their Facebook page at www.facebook. com/ChangeWorksinArgyll, contact the team on 01301 707 183 or email argyll@changeworks. org.uk for more information. The project is funded by the Scottish Government, delivered by Changeworks and supported by Argyll and Bute Council until March 2020. Visit www.changeworks.org.uk. I wanted an Easter bonnet, not c h i c k s !! up of independent local groups run on a voluntary basis by their members. No qualifications are needed to join and none are awarded. “Like all other U3As, we draw upon the enthusiasm, knowledge, experience and skills of our own members to organise and provide a wide range of interest groups and activities. join, as long as there are places available, and allows you to attend all the monthly meetings.” The monthly meetings are held in Helensburgh Parish Church Halls from 2.00-4.00 pm on the first Monday of the month. Organisers add: ”We have an interesting talk each month by a visiting speaker as well as news of events and interest groups. Look on our online events page to find the latest details.” Details of subscriptions are also on their web site u3asites.org.uk/ helensburgh/welcome. Window and door locks, hinges, handles, & damaged door panels & gaskets. Repairs broken or misted double glazed units. JOINERY & GLAZING All types of exterior & interior joinery & glazing, locks, tiling, kitchens, uPVC windows etc. WAVERLEY UNLIKELY TO SAIL FROM PIER Argyll and Bute Council say significant work will probably be needed at Helensburgh pier before the Waverley can visit the town again. The paddle steamer’s provisional spring timetable was published, with no calls scheduled for Helensburgh but two for Kilcreggan. It is now four months since a Notice to Mariners announced the closure of the 147 year-old pier, during which time the council has given the go-ahead for its £19m waterfront project which will see a new leisure centre built but has no provision for rescuing the pier itself. An Argyll and Bute spokesperson said: “The specialist timber testing that was being undertaken in December, is now complete. part of the structural analysis being carried out by the council’s design services team and an update will be provided to the harbour board. Councillor Roddy McCuish, Policy Lead for Roads and Amenity Services, said: “Officers have already met with Waverley Excursions to look at next year’s itinerary to discuss the overall condition of the pier, and whether we can re-open the berth face. “Obviously, the ability to allow the Waverley to berth next season will depend on the cost of any works required and the likely timescale for completing them. NEW ROLE FOR GARELOCHHEAD STATION A Royal Navy veteran is hoping to use the Garelochhead rail station as a centre to assist former military personnel in their transition from being on duty to living civilian life. The project will target those who are isolated and marginalised in the areas around Garelochhead, and is supported by the Scottish Government’s Aspiring Communities Fund, which helps groups and organisations deliver local priorities in the most deprived and fragile communities. military personnel in their transition from being on duty to living everyday life. The Garelochhead Station Trust was launched towards the end of 2018 through a partnership with the Kilmarnock Station Railway Heritage Trust, which works to try and return disused railway station buildings back into community use. Alan says preparations are already well under way and he hopes the newly-formed organisation will have an immediate and lasting impact in Garelochhead and the peninsula. The Trust has been working with Garelochhead primary school classes 6 & 7 to design a logo. The Trustees will choose a winner from a short list and everyone who has taken part will be receiving a T shirt as a thanks for all their efforts. Info on Facebook or project coordinator Morevain Martinmorevain@ksrht.org. With years of experience Cloudy2Clear have a wealth of knowledge and are recognised as a Which Trusted Trader, plus our work is backed by an industry leading 25 year guarantee. Cloudy2Clear also replace faulty locks handles and hinges on all windows and doors. Your friendly local Cloudy2Clear specialist is Peter Brummitt and he services Helensburgh and the surrounding areas. So, if your windows are steamed up, broken or damaged give Peter a call for a free quotation on 0800 61 21 118.
n All types of roof repairs, slate, tile & felt roofs. n Leaking roofs and guttering repaired & replaced. n Brick work and masonry repairs. n All aspects of exterior property maintenance. £14,000 has already been spent on CCTV provision in the park but the Friends feel that sadly this is not going to be enough to deter the determination of a criminal element in Helensburgh to vandalise and steal, afflicting the £3.5 million park regeneration project before it is even finished. The Friends explained that CCTV coverage has always been included in the budget and cables have been laid all around the park to enable it to be installed anywhere. However, it would cost an additional £50,000 to fully cover the park. Following many calls from the community for CCTV cameras in response to the recent theft of a memorial tree the Friends are asking local people to donate to a security fund. The fund has been kick started with an anonymous and very generous donation of £1,000 from a local resident. The Friends told us: “We are sad that the park is being abused and vandalised when so many people are working hard to make it a nice place for everyone to enjoy. Donate to the Just Giving page www.justgiving.com/ friendsofhermitagepark or send a donation to the Treasurer at 2A East Montrose Street, Helensburgh G84 8EP. We know you want the best day to day reliable & regular carer. This is Quality Care Scotland’s unique speciality. A1 Road Surfacing Ltd is a business at the cutting edge of monoblock paving design and installation. We provide specialist design and installation services for driveways, patios and landscaping. We can offer contemporary and traditional solutions to all your landscaping requirements. Over 50 years of written recommendations in the Helensburgh area. A trusted local company. CHARITY HELPS OVER 60S RESCUE A DOG The Helensburgh Grey Matters group recently drew attention to an interesting project which could help oldies enjoy a doggy companion, and help rescue an unwanted pet. Give a Dog a Bone, and an animal a home, is a small, unique and award-winning Scottish charity that helps the over 60s to afford a rescue pet companion, tackling loneliness in ageing years and the rising number of animals experiencing homelessness. source of company and affection. They also provide routine, encourage exercise and can give someone a sense of purpose. The charity was founded by Louise Russell in November 2013. Since then the charity has helped more than 300 animals, and their owners, find a brighter future, together. Louise, from Clarkston, East Renfrewshire, was given the Community Award from the International Fund for Animal Welfare at the House of Lords for her work. Louise says: “If finances are a barrier to adopting a pet companion we can pay the rehoming fee of a rescue dog and continue to support on a monthly basis, by paying for associated pet food costs. it has provided additional help in supporting terminally ill individuals to find emergency foster care for their animals or full time, forever homes for those who can no longer cope, bringing great peace of mind to those at a troubled time of life. McArthur Stanton goes from strength to strength Over the last 12 months, the introduction of a new Property Manager in Helensburgh, supported by additional new and existing staff, have contributed hugely to a very successful year. Our all under one roof approach offers a unique and bespoke service, from initial market appraisal, through the full selling process with a package that is tailored to your specific requirements. Our Letting Departments in Helensburgh and Dumbarton are amongst the biggest and most successful in the area, handling over 200 properties. Underpinning this is the vast experience of our property teams. Our comprehensive array of Legal and Property Services means you have our full team behind you all under one roof, working together to ensure all your needs are met. We can put you in touch with Independent Financial Advisors who cover whole of market services with access to a large variety of mortgage products, and therefore, can find the right package to suit your specific requirements. These features make us unique in the local market. Savings, investments and mortgage services are also catered for with your local Yorkshire Building Society within our Helensburgh office. If you want the best then visit the best! McArthur Stanton is your one shop solution. PLANTS SALE AT GLENARN The start of spring heralds visits to local gardens. The garden at Glenarn in Rhu opened for the season on the first day of spring and there is already lots of colour. The Geilston Gardens at Cardross opened for the new season on April 1st and Friends of the Garden are holding a Photo Walk this month to show off its highlights. Local photographer Katheryn Polley will lead participants through the Gardens and Woodlands, assisting with the selection of subject matter, composition and framing. Geilston is regarded as one of the National Trust for Scotland’s hidden gems. It is described as intimate and tranquil, with the secluded appeal of a private garden. On Sunday 28th April, from 2 – 5 pm, a special plant sale and open day is being held on behalf of Scotland’s Gardens Scheme charities and the Helensburgh Dementia Resource Centre with cream scones and tea available. together with many large-leaved rhododendron species and hybrids developed at Glenarn. The plants include magnolias, rhododendrons, acers, meconopsis, all raised from cuttings from Glenarn plants or from specialist seed exchanges and many other plants, mainly from the garden that do well in this area. Glenarn first opened to the public under the Scotland’s Gardens scheme in 1939, and open days were even held during World War Two, when visitors were advised to bring sugar for their tea because of rationing. Rhododendrons provide colour throughout April, May and June, with a wide range of shapes and flowers. EXPANSION PLANNED FOR TOWN’S CINEMA Helensburgh’s cinema complex housed in a former church has been a huge hit with the local community who have flocked to see the latest films as well as live shows. “The current toilets, kitchen and ancillary facilities are inadequate for the current and future use of the building. Now the charity behind the project has announced plans to expand its facilities by upscaling to four screens along with a function suite and bar. A decision on planning permission is expected this month. The Tower, based in the former St Columba’s Parish Church on Sinclair Street, has been open since 2016, operated by local charity The Tower Digital Arts Centre. The proposed extension will accommodate an entrance foyer, a bar, auditorium four, a function suite, teaching workshops and toilets. Teaching workshops are also part of the plans, which have been submitted to Argyll and Bute Council’s planning department by Glasgow architects Honeyman Jack and Robertson on behalf of the charity. A decision on whether or not the extension, which would also host new toilet facilities, can go ahead is expected from the authority this month In a statement published on the council’s website, the architects say: “To achieve a sustainable cinema operation it is considered essential to have a total of four screens. “Funding support has been indicated for the development of STEM subjects science, technology, engineering and mathematics education. The extension will complement the existing facilities to link the existing and proposed uses and provide adequate toilet and ancillary facilities with the aim of achieving a financially sustainable operation for the enjoyment of the local community and visitors to the town. The proposed extension will have level access at the entrance and level access links to the existing facilities. Wed 17th Cardross, Colgrain & Craigendoran Senior Citizens Association AGM Cardross Parish Church Hall 2pm. All welcome. la u s in and n e P e i r e iss ry t a P t n a P Producer and supplier of handmade sweet and savoury baked goods. Any special requests or product enquiries are welcomed. Now stocking timber for all your fencing and landscaping requirements. Stockists of; Complete the job with our skip hire service – Slabs, Sand, Gravel and three sizes available. all your other building needs. MAKING THE JOB WORTHWHILE The job of running a youth café for eight years can be quite a task, however every so often something special happens when a child excels at something that it has encouraged. And that is exactly what happened to Susie Will, Chair of the Cove and Kilcreggan Youth Café recently. Susie tells the CA: “When five local youth café children, took it upon themselves to spend a miserable weekend, selflessly cleaning up a particularly polluted area of our peninsula shoreline it warmed our hearts. “The feeling of achievement that we make a difference makes it constantly worthwhile.” Katie Bray, Emma Bray, Fiona Bray, Sophie Buchan and Eilidh Morton gathered a substantial amount of rubbish . Cove and Kilcreggan Youth Café have recognised this act with a small presentation of a certificate and a "Well Done" award – not to mention a news release to let the wider community know. The Café is a peninsula success story and now has a dance group, a football team and there’s integration ongoing with the sailing club, West Dunbartonshire Football and Cove Park Artists retreat. Young people come from all over the peninsula to its open door hospitality, and there’s always a trained and supportive ear for any young person with a problem. including viruses, antibodies, copper or iron overload, metabolic problems, and obesity. If a cause is identified, drug treatments or lifestyle changes may help. Otherwise a blood test once or twice a year is advised to give warning of any worsening, as it can remain stable. The liver weighs 1.5kg, its jobs including removing toxins and drugs from the body, metabolising fat, protein and sugars as well as making essential proteins, so it’s definitely worth looking after. Prevention is best, and healthy living with regular exercise, sensible drinking limits and keeping trim, will protect your liver as well as your heart! DON’T WASTE YOUR MONEY ON FELT DO IT ONCE - DO IT RIGHT! Traditional flat roof coverings become brittle and deteriorate over time. Based in Helensburgh we are ideally situated for most of the West of Scotland. Our service is more cost effective, quicker, easier to install, longer lasting than traditional methods and is environmentally friendly. Contact us today for a free consultation. Inspired by nature. Designed for living. Looking for care for an elderly loved one but don't like the idea of a care home? Electric ly H eating final cost comes o s s e l r o f f a ge st than a s ta ndard wet sy em! Intelligent, fully controllable electric heating Precise Heating Solutions are delighted to introduce the multi-award winning Intelliheat range of heating systems. These systems are so advanced, that they have been uniquely awarded Europe’s highest efficiency accreditation, The NF+++. Just imagine a system… that knows when you are in or out – and adapts accordingly. where each room has its own time and temperature settings. with electronic thermostat controls, accurate to 0.1 degree. with self learning technology, enabling maximum efficiency based on your lifestyle. which knows when you are on the way home – it even checks the weather forecast!! one of the funding avenues being explored and the group was working with Argyll and Bute Council to reopen the pier to marine traffic ‘as soon as practically possible’. In a recent statement Mr Lindsay says: “We can announce that we have engaged a reputable consultant to carry out a comprehensive study into viable options in regards to developing the pier and its environs for the benefit of the local community. The pier has been closed since a notice to mariners was issued last autumn, and as we report in this edition the Waverley paddle steamer’s spring timetable has omitted Helensburgh for the first time in many years as it is unlikely to be able to berth at the pier. the income generated would be sufficient to maintain the pier thus preserving the iconic structure for future generations. “We are currently exploring all funding avenues including the placing of the historical ‘Helensburgh World War Two mine’ at the east end of the town’s promenade. “The purpose of the mine is to draw attention to our cause and to collect donations from locals and visitors alike.” HSDP adds thanks for their assistance in accomplishing the siting of the mine to R.B. Steel of Helensburgh, Wallace Power Systems Ltd and Galt Transport Ltd of Dumbarton. Arthritis Care Arthritis Care is the UK’s largest organisation providing help and support for all people affected by arthritis. Contact us for more information on 0141 954 7776 or visit arthritiscare.org.uk. Is overeating a problem for you? Your nearest meeting is Dumbarton, Thursdays 7.30–9pm. Call us on 07946 179782 . Smokeline For free advice and help please call: 0800 848484. SSAFA’S HELP GAVE JACK A SAFE HAVEN Alison Sturgeon will be walking 26 miles in the Glasgow Kiltwalk to raise money for SSAFA, after they helped her secure funding for a lifechanging extension to her home. Mulvaney, their case worker, pulled off: “nothing short of a miracle.“ The project cost £29,000 and £18,000 of that was sourced by SSAFA. Although the building process was beset with problems, by Christmas 2018 it was finally completed. Jack now has a big lounge with a TV and sofa bed, plus a wet room and patio doors so he can have his own entrance. Soft lighting and thick carpeting mean the noise is muffled and it is a very soothing environment for him. Alison, who works in the town’s Cancer Research shop has a son, Jack, 23, who suffers with autism and a learning disorder. After leaving school Jack’s needs became far more complex and he struggled to cope with the change. Alison says, “At that age young people’s brains go through an enormous amount of growth, which can have a knock-on effect with their mental health and wellbeing. This growth coupled with his huge change in routine made life a real struggle for Jack. “My husband, Jonathan, was due to retire from the Royal Navy after 27 years in the submarine service. Luckily, he secured a job at Faslane as a trainer which was a huge relief.” It soon became apparent that their current living situation wasn’t meeting Jack’s needs, or their own. The couple had hoped to convert their existing garage into an adapted living space for Jack to be supported by his carers and to give them some much-needed privacy. The project was only made possible thanks to funding from SSAFA Dunbartonshire, Argyll & Bute Council, RN&RM Children’s Charity, RNBT and Poppy Scotland. Alison said: “We are indebted to them all for the patience and generosity. Please support SSAFA by donating to my funding page for the Glasgow Kiltwalk on Sunday 28th April.” See glasgowkiltwalk2019. everydayhero.com/uk/alison-33. To sign up, visit www.kiltwalk.co.uk. If you have any questions about joining Team SSAFA or to request flyers please contact david.black@ ssafa.org.uk or 07557268867. Your first choice for lawn care 2018 was a difficult year for your garden. Extreme weather conditions resulted in lawns that didn’t look their best. As we move towards the growing season, now is the time to start preparing your lawn to get the most from it. Our seasonal treatments start from just £15*. Due to high demand, and to avoid disappointment, we advise that you book your treatments early. For your FREE lawn analysis & no-obligation quote, contact your local branch today. Oratorio Choir have has revealed the exciting news that eight of the choir are taking part in an international performance of Will Todd's 'Mass in Blue' in the New York Lincoln Centre. schools for one afternoon only at David Geffen Hall at Lincoln Center blending their voices to celebrate the music of the great English composer. And in other news, two members of the Helensburgh Oratorio choir had a chance to meet the celebrated composer Sir Karl Jenkins. Anne Mitchell and Vivienne Murray went to Berlin at the beginning of November 2018 to join with a massed choir of over 2000 choristers from 30 countries around the world including Canada, UK, Ireland, Australia and New Zealand. To celebrate his 75th birthday, Sir Karl is conducting The Armed Man in several concerts including Glasgow. Vivienne added: â&#x20AC;&#x153;Several members of the Helensburgh Oratorio Choir went along to hear the concert and Anne and I were lucky to meet him again.â&#x20AC;? and wonderful to sing in the company of so many different people from around the world. We also were lucky enough to meet him twice while we were there.â&#x20AC;? The music was titled The Armed Man - A Mass for Peace and Sir Karl Jenkins was conducting the World Orchestra for Peace along with the massed choir. Choir spokesperson Kathryn Clark said: â&#x20AC;&#x153;This follows on from our very successful concert in December, when our then conductor Jonathon Swinard's enthusiasm and encouragement coaxed us out of our comfort zone to perform this amazing piece. He also secured The Will Todd Ensemble to accompany the choir. As well as performing on April 7th, we will also be taking part in the TNYC Tartan Day parade on the 6th.â&#x20AC;? ONE-TO-ONE LESSONS IN GUITAR AND UKULELE. Experienced and friendly teacher. Home visits available. Acoustic, Electric and Classical styles. Why not use our MOBILE 'SHOP AT HOME' service. Choose from a large variety of samples brought to you in the comfort of your home. A planning decision on a new care home containing bars and a beauty salon sited near Helensburgh’s Hermitage Park is expected this month. This month: SIMPLIFIED DIVORCE The breakdown of a marriage and subsequent legal process of divorce can be an emotionally difficult time. Fortunately, in Scotland we have the benefit of the Simplified Divorce Procedure. What's On... YOUR DEFINITIVE EVENTS DIARY FOR THE HELENSBURGH, LOMOND & SURROUNDING AREA. NOW OFFERING NAT 5 MATHS TUITION Exam preparation for all aspects of the course. Primary tutoring available to help improve numeracy and literacy skills. Qualified teaching staff with over 18 years teaching experience to help your child improve their understanding of core areas. From P1 to S2. Helensburgh Sailing Club 7.30pm. Open to all members. Cove and Kilcreggan Bowling Club 2pm open day. Normal bar opening times: Tuesday 6.30-11pm, Friday 6.30pm - 1am, Saturday 6.30pm-1am. Everyone welcome. Craigrownie Church, Cove 2.30pm. Tickets ÂŁ6.00 including tea/coffee and home baking. Available from the Events Committee and Kilcreggan Post Office. An afternoon of music with The Buchanan Ensemble (Stephen Adam and Friends). All proceeds to Church Funds. Cove and Kilcreggan SWI Craft Evening Cove Burgh Hall 9.30pm. Our monthly craft drop in. Members ÂŁ2 to cover hire of room. Guests ÂŁ5. tea and coffee available. WIN Pick up an egg from A £ us, decorate it then VO 1 0 UCH ER! hand it back k to enter! TREATS NOT SWEETS THIS EASTER! II hold regular advice surgeries, and II would be happy to discuss any advice and be happy any I hold hold regular regular advice surgeries, andme. I would would be happy toindiscuss discuss any issues you would likesurgeries, to raise with Feel free to getto touch to set up issues you to raise with Feel free to in issues you would wouldIlike like to raise with me. me. Feelthe free to get getbelow. in touch touch to to set set up up an appointment. can be contacted using details an appointment. I can be contacted using the details below. an appointment. I can be contacted using the details below. A local company offering face to face support and advice on all employment related matters such as:  Policy development  Recruitment  Contracts of employment  Absence management  Discipline and grievance  Training and development We promise to provide discreet, responsive advice and solutions for small business owners and their employees. ways to keep things fresh and a recent skills development initiative organised by club coach, Carly Park, welcomed International Sirens netball player Hayley Mulheron to Helensburgh to share her knowledge and help inspire squad players leading into the second half of the season. the age of 14 who are at any standard – so whether you haven’t played netball since school and fancy remembering what it was like or you are looking to play competitively in the league, why not come along and find out more.” Helensburgh Netball Club is also a great way to make new friends, particularly if new to the area, and has social events on nearly every month. Contact details www. helensburghnetballclub.co.uk. MEMBERSHIPS FROM JUST £22 PER MONTH Newly refurbished Gym. State of the art equipment. Group Fitness Studio with 30+ classes every week. One to one and small group Personal Training. Flexible membership options to suit. Fully qualified and experienced instructors. Friendly and welcoming facility. Linda only took up running at the “grand old age of 40” to improve her fitness, but eight years later she is ready to pound the streets of London in Britain’s number one marathon event to raise funds for the British Heart Foundation. She tells the CA: “I still remember my first run and how tough it was and thinking when I got home that there was no way I was doing that again! Now, nearly eight years on, with five half marathons and many 10k races under my belt I am about to embark on my biggest running challenge to date. Want a wide range of entertainment to suit your mood and taste? Look no further than the Community Advertiser’s guide. Whether testing the old grey matter at a quiz, tickling your tonsils at karaoke or hitting the dance floor, we have the list to inspire you. SAVE THE DATES Anita Manning and Great Western Auctions will be at Helensburgh Sailing Club, Friday 26 April 2019 from 10am to 2pm. To value your antiques and collectables. Tickets £10.00 (for three items) available on the day or in advance from Terri Paterson 07591 089160. All proceeds are in aid of the RNLI. Items forwarded for sale on the day will receive a discount on auction commission. Tea and coffee will be provided. Unless otherwise stated, all entertainment runs 9pm – 12 midnight. Cardross Primary School Association invite you to their Gala day on Saturday 18th May from 12-4pm to be held at the school, Kirkton Road, Cardross. If interested in having a stall at this event, call Ruth on 07754 105126 or Angela on 07508 388079. Tables cost £15. Charity tables cost £10. the run without needing to slow down or walk. then you should be well prepared for the event and confident that you can complete 10K. Plan ahead so you don’t have anything to worry about on the day of the race. Aim to arrive at the event early so you have plenty of time to get ready and have a short jog to warm up. Remember not to start too fast, start at a steady pace that you think you can maintain for the whole distance and if you are feeling good towards the end then you can increase your pace. Most importantly after all your hard work, enjoy the event. Good luck! TENNIS CLUB BIDS TO UP MEMBERSHIP The Helensburgh Lawn Tennis Club committee has pledged to increase its membership and over time hopefully return to previous levels. wider area. Adds Bobby: “We’re determined to be as inclusive as possible by making the sport we all love much more affordable to a wider local audience.” A new annual family rate has been introduced – £250 for a family of 2 adults and children under 16 years, a saving of almost 40% from previous rates. In addition, adult fees have been reduced to £150, a saving of 25% from previously. Junior fees are already amongst the lowest in the west of Scotland, £33 for primary school children and £55 for secondary pupils. The club is also introducing a 20% discount at all junior coaching sessions for members alongside its free Saturday match play sessions. Don’t worry if you’ve never picked up a racquet before, we’ve got that covered with our coaching to suit all levels. All adults will enjoy one free block of coaching over the year including our adult beginners and improvers classes. Children of new adult members will receive a block of coaching completely free of charge. To find out more information log onto www.tennishelensburgh. org.uk or facebook @ helensburghltc. WORLD BOOK DAY CELEBRATION Children at Colgrain Primary celebrate World Book Day donation from Taylor Wimpey. The Community Advertiser offers you a chance to tell your story to readers in over 13,000 homes and businesses. We are always pleased to get story suggestions from our readers. It could be news about your club or organisation, it could be about you or a friend doing something for the community or a special event. We do need to hear from you well in advance of publication so we can plan the pages. The earlier the better, ideally by or before the first week of the month: e.g. 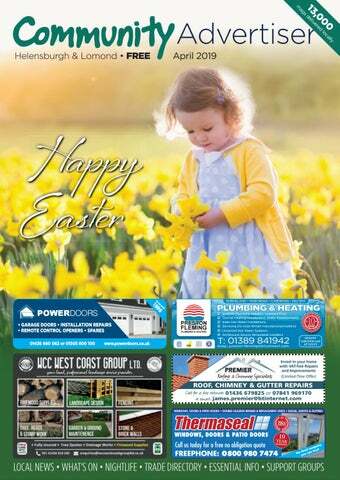 by 7th April for the May edition. 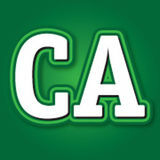 You can submit story ideas direct by clicking “submit” on www.communityadvertiser. co.uk or email editor@ communityadvertiser.co.uk. DEFINITIONS: ‘Standards’ means the British Code of Advertising Practice and the provisions of any law applicable to advertising including, but not limited to, the Trade Descriptions Act 1968, the consumer Credit Act 1974, the Control of Misleading Advertisements Regulations 1988, the Financial Services Act 1986, the Business Advertisements (Disclosure) Order 1977 and all amendments and replacements. It is hereby agreed that: the placing by the Advertising Client of an Advertisement is deemed to be acceptance of these Conditions of Acceptance of Advertising. All advertisements in this publication must not contravene the Standards. Insertion of Advertisements and/or Editorial is strictly at the discretion of the Publisher. The Publisher shall not liable for any loss or damage incurred by the Advertising Client as a result of any failure, negligence or omission by any party in the course of the distribution or circulation of the Publication in which the Advertisement is scheduled to appear. In the event of any error, misprint or omission by the Publisher in printing of an Advertisement, the Publisher will either re-insert the advertisement, adjust the cost or provide a refund. This does not apply if the Advertisement has been already been approved by the Advertising Client prior to the publication. The total liability of the Publisher for such an occurrence shall not exceed the amount of a full refund for that particular Advertisement. The Advertising Client agreed to indemnify the Publisher in respect to all costs, damages or other charges falling upon the Publisher as a result of legal actions or threatened legal actions arising from the publication of the Advertisement, or any one of more of the series of Advertisements, published in accordance with the copy instructions supplied to the Publisher. The opinions of the Contributors to this Publication are not necessarily the Official views of the Publisher. Readers are reminded that when purchasing items or services advertised in the Publication that the Publisher cannot be held in any way responsible for the quality or correctness of the items or services included in the Advertisement. Yvonne Buchanan, Sales Executive for Taylor Wimpey West Scotland joins pupils at Colgrain Primary in Helensburgh to celebrate World Book Day. The donation of £250 and 100 copies of its own fun and informative book ‘How we build your new home with Millie Mortar and Handy Andy’ to Colgrain Primary School is one of many ways in which Taylor Wimpey is supporting the local communities in which it builds. To find out more visit www. taylorwimpey.co.uk/mediacentre/news. Further information about Taylor Wimpey, including new homes developments in the west of Scotland, can be found online at www.taylorwimpey.co.uk.